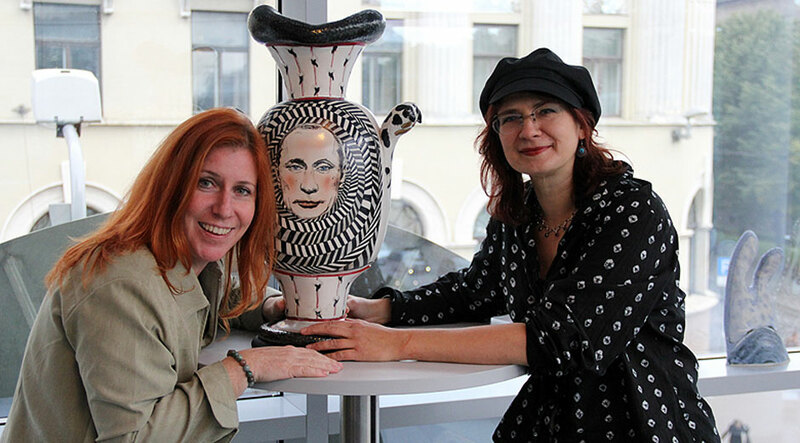 Skuja Braden is the pseudonym and combined names of the International ceramic art team Inguna Skuja from Latvia, and Melissa Braden from Sacramento, California. They began working together in February of 1999 and have continued to work together since that time. They both work on every aspect of the design and form together. The very process of their collaborative creating, gives their work an extremely individualized and unique character. Skuja Braden’s work can be found in private collections and museums in places like Canada, Croatia, Denmark, France, Germany, Hungary, Italy, Korea, Lithuania, Switzerland, Russia, United Kingdom, and the United States. New Skuja Braden Exhibition in Lithuania! Skuja Braden is simultaneously a fictitious person, noted artist, and a bandit and thief who has stolen the individual identities of artists Inguna Skuja (from Latvia) and Melissa Braden (from California). Skuja Braden, is the pseudonym made up of both artists last names and the signatures marking all their collaborative works. The two have worked together on all aspects of their collective works since 1999. Inguna Skuja and Melissa Braden both exists; however, in the art world it is literally Skuja Braden who exists, while Inguna Skuja and Melissa Braden individually, take on secondary roles of authorial existence. Skuja Braden is the third artist to have grown out of their collaboration. Not only does this third artist have a mind of its own, it also rests or fills up a third position arising from the shared efforts of these two artist. Thus Skuja Braden is 1+1=3. Skuja Braden has been featured in Ceramic Monthly and published in 19 books. Skuja Braden works can be found in private collections and museums in, Canada, Croatia, Denmark, England, Estonia, France, Germany, Hungar, Italy, Korea, Latvia, Lithuania, Norway, Sweden, Switzerland, Russia, and throughout the United States. We are both simultaneously, I and Other; like two mirrors facing each other, each of us reflects a bit of our tiny corner of the world onto the other. Where our reflections meet in the middle, a prism is formed which goes on, and on, endlessly. A dialogue is created from the inter-reflecting characteristic of our double-creating, and constantly reveals itself as a conversation taking place between us and others. Our work is an amalgamation of our combined talents and gifts melded together into a singular statement. European President’s Collection 1997: (Icelands Prime Minister – David Odsen, Prime Minister of Norway – Kjell Magne Bondevicks, Head of the Polish Minister of Cabinets – Yersik Karol Buzek, Russian Chief Government-Viktor Chernomirden, Chancellor of Germany – Helmut Kohl, Latvian President of Ministers – Guntars Krasts, Prime Minister of Sweden – Pavo Tapia Liponin, Prime Minister of Denmark – Paul Neerup Rasmussen, Prime Minister of Estonia -Maart Seemans, Prime Minister of Lithuania – Gedeminis Vagnors. Prime Minister of Sweden – Jurans Parsons, European Commission President – Jack Sanders, and Vice-Prime Minister of England-Jack Prescott. 2008 Held, Peter. A Human Impulse: Figuration from the Diane and Sandy Besser Collection. Arizona State University Museum Press. 2006 Reber, Leona. Fantastic Feats & Family Connections: A Feats of Clay XIX Award-winner Related to Lincolns Founding Family. -Aizkraukle’s 45 year jubilee, commission from the City of Aizkraukle to make 15 works in porcelain referencing the city and its surrounds.